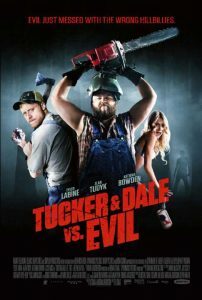 First up on the list is Tucker and Dale Vs. Evil. This movie is great on so many levels. If I said the story is about a group of kids heading out into the woods for a weekend of fun but things turn deadly when they meet up with a couple of local rednecks, you’d have to think, “How can that be original?” Well, because the movie isn’t from the kids point of view, it’s taken from the rednecks point of view and it’s absolutely hilarious. As I mentioned in another post, when I first saw this movie it was a rough cut. It didn’t have a lot of post production in it yet and some of the takes used in the cut were different than the actual release. But, my review stands the same. It’s so original and so funny, it’s just a must see. I think I’ve seen this movie maybe 9 or 10 times and it’s never gotten boring. I laugh every single time. You’re really missing out if you haven’t seen it. 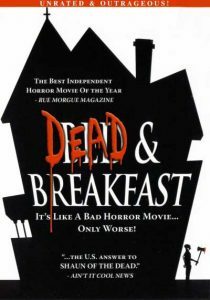 Next up is Dead & Breakfast. It’s about a group of friends that take a wrong turn on their way to a wedding. They stay for the night at a bed & breakfast and ancient evil is released that begins to turn the town into zombies. It’s just a crazy good time. This movie was so much fun. It’s not just a good zombie movie, it’s a comedy and in someways, a musical. I really don’t know how to explain this one. There’s just really not much like it out there and it’s about as much fun as you can have watching a horror movie. 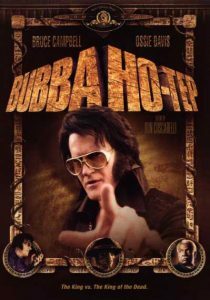 Now, if you like a little bizarreness mixed in your horror movie diet, Bubba Ho-Tep should be a must on your list. The film centers around a retirement home where Elvis and JFK are now reside. As residents begin to die, the two team up and discover it’s an ancient mummy that is responsible for the deaths. Are they really Elvis and JFK? Can they stop his murder spree? It’s fun, original and so outrageous and yet oddly all believable. Now I realize that the many Bruce Campbell fans know this film already. But, those that aren’t aware of his greatness, you can’t go wrong with this movie. Bruce Campbell plays Elvis as a senior citizen and the late, great Ossie Davis plays JFK. What more do you need to know? Watch this movie! On a side note, if you really want to understand why Bruce Campbell is an icon, go watch The original Evil Dead trilogy. The first and third in the trilogy are so great, words just can’t completely capture their true awesomeness. 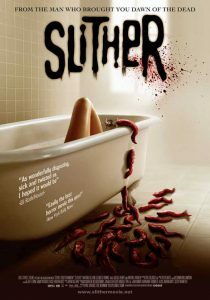 Slither is another underrated film. It’s story is part sci-fi, creature feature and alien invasion. It takes place in a somewhat rural small town. There’s a meteor strike in the forest causing a contamination that is spreading and it’s up to the sheriff, played by Nathan Fillion, to save the day. It’s got great dialog, special effects and a sense of humor that isn’t overbearing. The funny comes mostly from the crazy situations. But, this film has an amazing cast, Nathan Fillion, Elizabeth Banks, Michael Rooker to name a few. Hell, it’s even got Rob Zombie in it. Great, great fun horror movie. I don’t know why this film isn’t better known. It’s yet another horror movie I have mentioned it here on Bad Horror Movies before. I’ve also mentioned Slither before in conversations with people. No one I’ve talked to has ever seen it and that is a shame. This movie is outstanding! If you don’t like this movie, we simply can’t be friends. This brings us to the final movie on this list. Ginger Snaps. This turned into an awesome trilogy. It’s about a two teen sisters. One is violently attacked by a wild creature. Her wounds heal quickly and something is obviously not right. It’s not really a comedy horror movie but the death obsessed girls just have this goth charm and morbid attitude that is simply fun and entertaining to watch. It’s got scares, it’s got some gore but most of all it will keep you wanting more. Ginger Snaps stars Emily Perkins and Katharine Isabelle as the sisters and their performances are fantastic. I highly recommend getting the trilogy and spending one night this month enjoying the series. You won’t be disappointed. In fact, it would make a pretty good date night/movie night. It’s got werewolves and two smart women in the lead rolls. Excellent! And there you have it. These movies aren’t completely unheard of but they certainly don’t get the attention they deserve. If you haven’t seen them, give them a go. They really are worth the time.